Sabah is known as the Land below the Wind. It is located in East Malaysia, on the northern part of the Borneo Island. Other than Malay, Chinese and Indian, Sabah is a state that are shared by people of many different ethnics and cultures like the Kadazan, Dusun, Bajau, Murut and many others. There are many places of nature great as holiday destination here especially the unspoiled beaches all around Sabah. Other than that, Sabah is a place with good food especially seafood due to their freshness and affordable prices. The beef noodles here are well known as “Ngiu Chap” by the locals. It is a common but tasty food here as the soup based are rich with the broth slow-boiled from the beef bones with Chinese herbs and spices. The meats are very tender as when you take a bite they basically melt in your mouth. Another famous noodle is the fresh pork noodle. 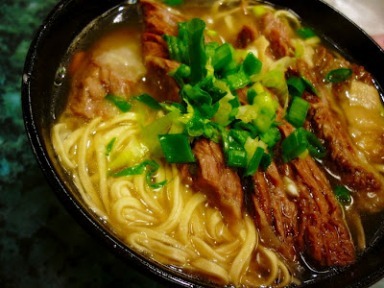 The noodle consists of thin slices of fresh pork and vegetables served together with noodles. The porks are well eaten together with dark soy sauce. It is a simple yet not to be missed dish when you visit Sabah. There are lots of noodles dish in Sabah, another must try is the deep fried pork noodle where the pork are deep fried and then cut into thin slices and added on top of noodle with the special pork broth. This is a dish that is definitely worth a try. From the name you can tell that Tuaran Mee is originate from Tuaran, a small town in Sabah. This is a popular dish found only in Sabah. The noodles are stir fried with extra flour and egg giving the springy texture and and great fragrance to the dish and added with char siew (barbequed pork) and vegetables. Barbequed chicken wings are a type of finger food extensively liked and enjoyed by the locals and visitors in Sabah. Visitors can get it almost anywhere where they sell food. Basically the chicken wings are marinated with some secret sauce which are generally sweet and savoury and are barbequed over charcoal flame. When served, drizzle some fresh lime juice and these mouth-watering wings will get you asking for more. Another dish is the grilled sting ray where the sting rays are marinade with sambal sauce and wrapped in foil together with vegetables and grilled. It is one yummy dish you must try. Bak Kut Teh meaning pork meat and bones in tea (the soup), the dish consists of pork ribs simmered in soup boiled with Chinese herbs and spices for long hours and is served with rice with soy sauce, garlic and chopped chili. It is a must try dish when you visit Sabah as the taste is different from the Bak Kut Teh found in West Malaysia.